Over the past year, we have received 59 titles in Neurosurgery from eight publishers, with two publishers accounting for the vast majority of them – Thieme and Springer. So far, we have published reviews of 30 of these titles. 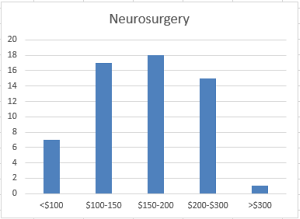 Neurosurgery books tend to be expensive, and the prices of the books we’ve received range from $49.99 to $839.99, with most exceeding $100.00, for an average price of $186.11. Doody’s Core Titles 2018 features 21 titles in Neurosurgery from seven publishers, 11 of those from Thieme. Of the five Essential Purchase titles, four are from Thieme with one from Wiley-Blackwell.